Like seems to be the case for me with what (relatively) few Spawn issues I’ve read, I don’t have an easy time summarizing it. This one, Spawn seems to have been “outed” in the media–the world now knows he exists–and so he has to deal with that. He’s living in the alleys amongst a number of other Homeless, serving as a protector to them, though he seems to be less than thrilled at their growing “reliance” on him. After being attacked by a rogue demon, he confronts the entity and learns its backstory–it’s not actually a demon, but a man who was experimented on, resulting in his current form. He seeks vengeance on a gangster named Tony Twist, and given the situation, Spawn sees more benefit in helping than opposing, if his people are left alone as a result. I bought this issue with a number of other “quarter books” at a Half-Price Books earlier this year…and I suppose for that price, it was worthwhile. 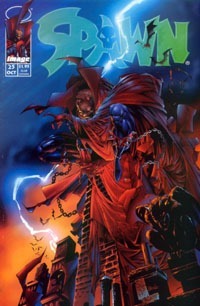 I have another copy–my original–of this somewhere in one of my too-many longboxes, but was interested in this issue this time the same as when I originally bought it: the cover, and it’s Spawn #25, one of those “special number” issues. I also remembered there being something else about this, like it being part of some “creator swap” month, but on reading this couldn’t tell if it was part of that or not. The story is typical Spawn for me…I’m not really sure how else to put it. I recognize Spawn himself of course, Al Simmons; his (former) wife Wanda, and at least know of the man Wanda is married to here. I remember (vaguely) the sense of–at the time–having no clue what Spawn was ‘about’ aside from being this disfigured entity with a huge cape, apparently back from the dead with some sort of “deal with the devil” thing involving his powers and some kind of amnesia that resulted in his living with the homeless/street people. The art is good overall…which I pretty much expect from Silvestri‘s work. I’m not overly familiar with it, but I’ve seen enough of it to know that I associate it with 1990s/Image stuff (as well as the Grant Morrison New X-Men story Here Comes Tomorrow back in early 2004). The art fits the book…though after reading the story itself and getting into some of the text/backmatter stuff, I gather that Silvestri was NOT the series artist at the time, and so that was probably the creator swap–the creators maybe kept on plot/writing, just swapped books for art duties or such. Whatever it was, it was over 21 years ago, and for Spawn, nearly 240 issues ago as of Spring 2016. I was impressed with the cover’s visual as well as the physical issue itself–not quite a cardstock cover, but hardly some flimsy paper, and the interior pages seem good quality as well. Thus, for the physical product itself, the 25 cents I paid was mostly worthwhile. Though I read the issue in isolation, it brought back slight memories of having read it back in 1994, and given my attempting to follow recent/current issues of the title, I’d consider my money well spent…though I maybe appreciated the issue/reading experience more for the backmatter than the story content. Among other things, while knowing the title has been notoriously late in its time, this issue seems to have come out at a time the book had had some major issues in timing, shipping in this order: 18, 21-24, 19, 25, 20, 26. There’s even an ad explaining things a bit, as well as a “cartoon” image “Todd Can’t Count” trying to poke fun at the situation. 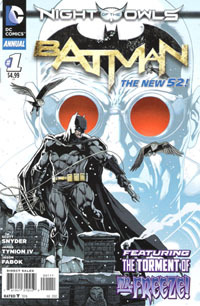 I find that morbidly amusing in a way at present, given recent complaints of books RE-numbering and such, and continued amazement that this title is presently–in 2016–the highest-numbered (legitimately) comic that I can think of published in the US (Regardless of returning to “legacy numbering,” Detective and Action from DC lost that designation in the 2011 New 52 reboot). I somewhat recall seeing mention somewhere of Spawn having shipped issues out of order, in some online discussion years ago, but didn’t recall exactly when that was, so coming across it hear piqued my interest, and I’d actually be somewhat interested in working on tracking those issues down. I actually already have the first 12 or 13 issues of the series, so can’t imagine it would be terribly hard to find the rest of the run up to this point; nor overly expensive given what a “hot” book Spawn was at this point in the ’90s. But I suppose that’ll be a back-issue quest for some other time, if it even still holds my curiosity by the time I’d get around to it. All told…this was an ok issue, though not anything I’d encourage hunting down. If the cover strikes your fancy or you want a similarly randomish reading experience, it’s worth the 25-cent purchase, but I wouldn’t recommend paying more than $1, possibly $2 and absolute most for this (and it’s a 21+ year old issue with a $1.95 cover price). I came into Dead Man’s Run having no honest idea what it was about. The title itself suggested maybe someone dies and comes back, or has some fatal countdown looming and they have some mission to carry out despite knowing death is imminent. Turns out there’s this prison, with guards and all that…and what they’re guarding is Hell. Like…THAT Hell. Their prisoners belong there, and they basically just make sure they stay put. There’s a warden who seems to be something more, and some plot seems to be in motion. The zero issue sees the death of a guard who with his last breath as a live man requests another. In the premiere issue, we meet Sam–a doomed cartographer who finds himself stuck in Hell at the side of the deceased guard, who seems poised to show Sam a whole different world than he ever dreamed existed. Meanwhile, we get a hint at the nature of the warden, and some of Sam’s motivation (the car wreck that he died in and woke up in Hell also left his sister in Hell–something he’s not going to take lying down). This #0 and #1 really feel like the pilot episode of a tv series, more than just the premiere of a new comic series. The story–what’s set up so far and where it seems it might go, and the execution–seem very cinematic in a tv sort of way. I’m not entirely thrilled with that, because I don’t know that I want to READ a tv series. That said…the story’s got a couple interesting hooks that leave me curious for the next issue. The art is very solid and in general makes the story flow. 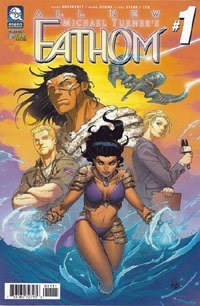 Stylistically it doesn’t seem at all like a super-hero comic (which is good, because this most certainly is not of that genre) nor does it seem hyper-realistic. It just has a comfortable feel that carries things alone. The writing is solid…I know next to nothing about these characters, but there’s enough there for the potential to shine. It’ll be interesting to find out more about Sam’s past and the relationship with his sister–and if there’s anything special about either of them that’ll play into things. The prison guard, too, has a glimmer of something more. The glimpses we get of the warden suggest a lot more to her as well, that COULD wind up being cliche, or could provide something that might make for an interesting (eventual) comparison to the Hell we find in Gaiman‘s The Sandman: Season of Mists. I made the reference above about this being like a tv series. Using that comparison….this puts me in mind of the first season of Prison Break if the imprisoned brother arranged for the other to be jailed, but dealing with a prison of hellfire and brimstone rather than steel and concrete. Aside from the story and art, there’s also the fact that this is backed by Gale Anne Hurd’s studio…so I’m inclined to give this a bit of time to take shape if someone who helped to get The Walking Dead from comic to tv endorses it. I received these two issues free as review copies, so the only up front cost to me was the time taken to read these. I don’t see a price on the #0 issue, but #1 is listed as $3.50…which earns points from me for being $.49 cheaper than most Marvel comics. As something cheaper than a standard Marvel, I’m more apt to buy #2 than I am one of those $3.99 Marvels. The story so far seems to be–as said–like a pilot episode, so I’m not entirely sold on the singles, but reading these has me definitely interested in either picking up the next issue when I notice it on the shelf, or at least checking back before too long for a graphic novel collection. You could certainly do much worse than this book…and it’s not off to a bad start at all.